We’re pleased to release our course programme for Spring 2019. 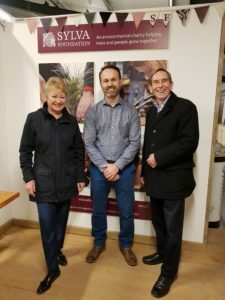 All courses will be supported by our new dedicated Teaching Barn, and overseen by our newly appointed Head of Wood School, Joe Bray. Learn how to perform guitar ‘set-ups’ so that your guitar sounds and plays at its best. Saturday 26th January 2019, 9:30am – 4:00pm. Cost £100. 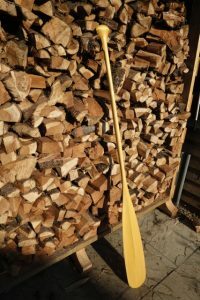 During this two-day course you will learn how to shape a single canoe paddle from Ash using hand tools. Saturday 2nd and Sunday 3rd February, 2019, 9.00am to 5.00pm. Cost £225. 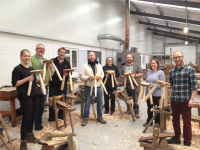 Working with green wood using simple hand tools, by the end of this two-day course you will make a three-legged stool. Saturday 9th and Sunday 10th February, 2019, 9:30am – 4:00pm. Cost £225. A two-day course to learn how to work with green wood using simple hand tools, and a pole lathe, to create a stool with turned legs. Saturday 9th and Sunday 10th March, 2019, 9:30am – 4:00pm. Cost £225. 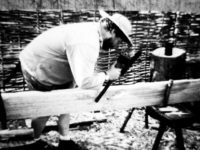 Learn about Anglo-Saxon building woodwork, based mainly on the study of surviving wooden remains, including a review of relatively new evidence, with live demonstrations of tools and techniques, and opportunities to watch treewrighting in action. Led by leading archaeological woodwork specialist Damian Goodburn BA PhD. Saturday 23rd March 2019, 10.00am-4.00pm Cost £75. 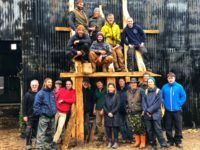 During this unique one day treewrighting course you will learn and develop skills and knowledge in the making of a timber-frame using traditional tools and techniques. Five one-day courses available which can also be booked as a block. Available on 20th,21st,22nd 23rd & 24th March 2019, 9.00am-5.00pm. Cost £100 per day. 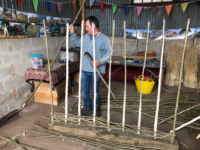 Students will be taught hazel splitting and how to make hurdles on the Saturday and then will practise making hurdles on the Sunday. Saturday 23rd and Sunday 24th March 2019, 10.00am-4.00pm. Cost £200. Saturday 27th and Sunday 28th April, 2019, 9.00am to 5.00pm. Cost £225. 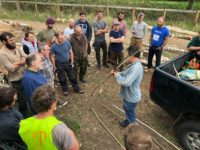 Learn and practise how to split hazel and make hurdles with coppice worker and craftsman Simon Farndon during this two-day course at the Sylva Wood Centre. Hazel hurdles are a very popular and attractive alternative to garden panels or garden screens and wind breaks. Split (cleft) and round hazel rods are woven around hazel uprights (zales). There are slight variations on design between different regions, but students will learn to make the most robust hurdles using good quality graded split hazel, which is twisted around end posts to produce a very strong and robust hurdle. 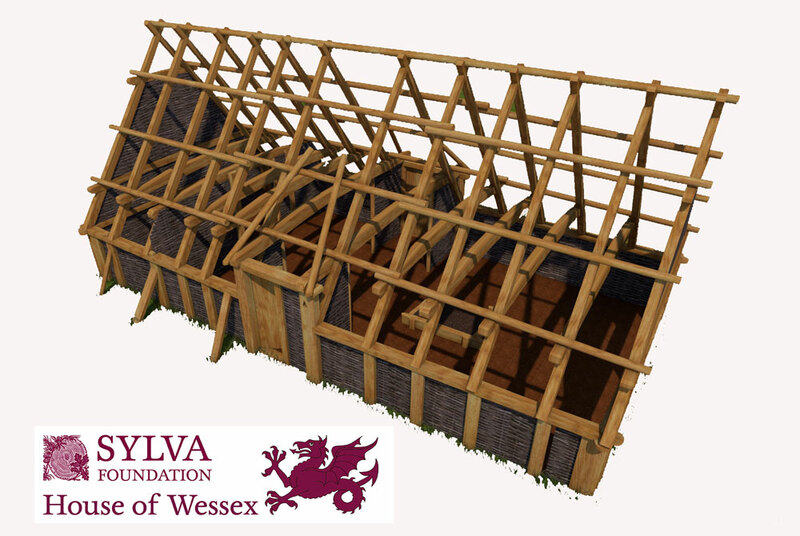 The hurdles that students make will be used in the Anglo-Saxon reconstruction of the House of Wessex, to be built over the summer of 2019. If they wish, students on this course will be welcome to volunteer to help with this by making more hurdles later in the year, or by helping fix hurdels to the wall annd roof structure of the building. By taking part, students will not only help in this exciting volunteer project, but leave with the requisite skills to make their own hurdles at home. Cost £200. Lunch provided. Maximum of 8 places. We are pleased to offer five one-day courses in treewrighting and timber-framing, from 20th to 24th March. Full training will be provided (no prior experience necessary). Although you will be working undercover, the course will be ‘outdoors’, so you will need to wear appropriate clothing. A programme of evening events will also be on offer, including a range of talks on relevant craft and history, and social events. You may book for more than one day. Please note that the activities will be physically demanding, so please take this into account before you sign up to all five days! 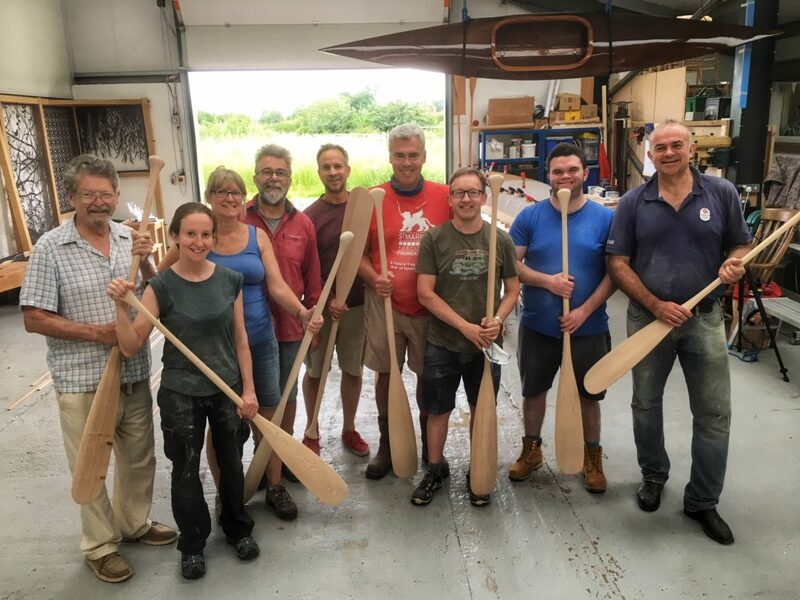 During this two-day course with award-winning boat builder Colin Henwood, you will learn how to shape a single canoe paddle from Ash using hand tools. 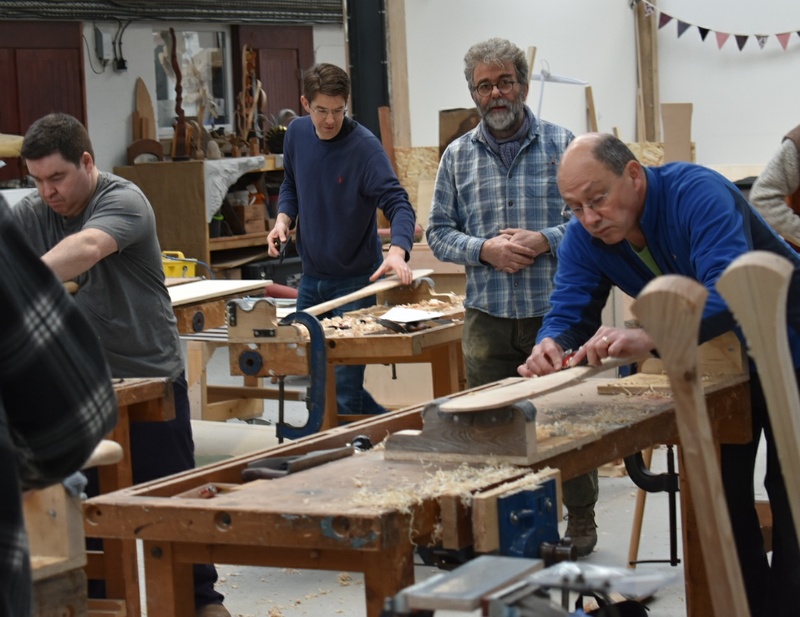 Student on Paddle making course, January 2018. Colin was fantastic; his attention to detail and support ensured we all left with a paddle I think even he was happy with! Working with ash – our superior native hardwood. Using traditional skills and tools you will produce a complex shape with hand and eye. Learn how to finish your smooth and elegant design. Take home a unique and usable canoe paddle ready for a varnish or an oil finish. Tools and materials included (if you wish to bring your own tools please discuss this with the tutor). Colin Henwood founded his boatyard, Henwood and Dean Boatbuilders, in 1982 specialising in restoring and building wooden Thames launches. The boatyard received many awards in the UK and abroad, and in 2014 Colin was awarded Maker of the Year by the Heritage Crafts Association. In October 2016 Colin handed the boatyard over to two of his team who are successfully continuing the tradition he began 35 years ago. Not one to retire, Colin has established a workshop at the Sylva Wood Centre where he is currently re-building a 1920 Thames motor canoe. 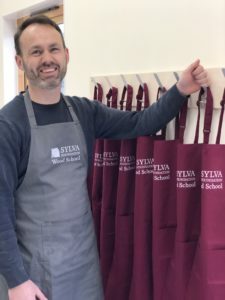 Our recently-appointed Head of Wood School, Joseph Bray, introduces himself and his new role with Sylva Foundation. I began my career in the furniture industry in 2000, as a designer and craftsman with Richard Williams. My role progressed from junior craftsman to production coordinator giving me an introduction to the diversity of the industry whilst working on bespoke projects for private clients. Prior to this I studied furniture design and craftsmanship at Buckinghamshire Chilterns University and I went back to complete a masters in furniture design, graduating with distinction in 2010. 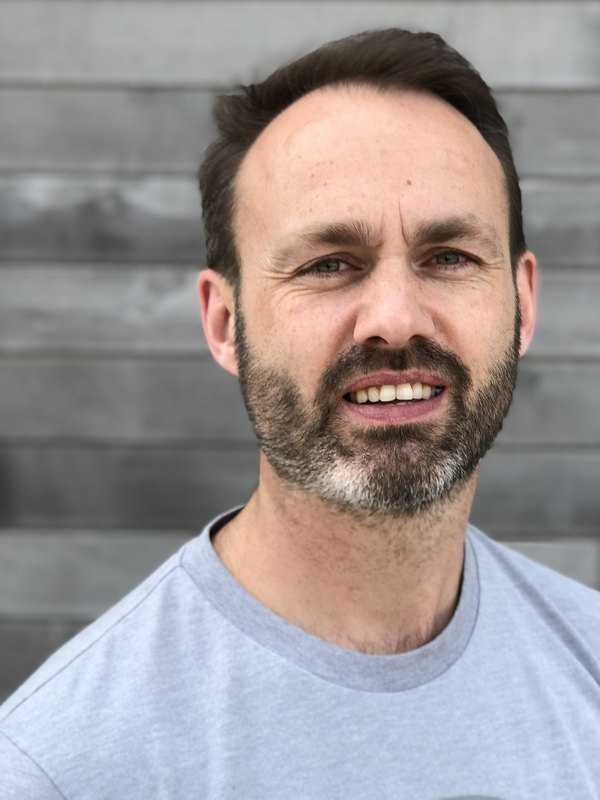 At an early stage I knew I wanted to teach and, benefiting from a very supportive employer, I undertook some teacher training and worked at Rycotewood providing one-to-one woodwork for autistic young adults. This valuable experience ultimately led me to make the transition between industry and education, taking up a full-time role as a teacher across the full range of programmes at Rycotewood. In 2010, I took responsibility for course leadership of the Foundation degree and BA Hons programmes. I successfully led the validation of the degrees with two university partners; Bucks New University in 2010 and Oxford Brookes University in 2015. Students and graduates have been incredibly successful, winning national awards, bursaries, and residencies. My particular interest is in developing industrial partnerships leading to live projects, study trips, work experience, internships, and sponsorship for students. Recent collaborations include live projects with AHEC (American Hardwood Export Council) exploring the characteristics of red oak, designing public seating for the RAF museum – London, as part of the 100-year anniversary, and live briefs with furniture manufacturers Ercol and William Hands. 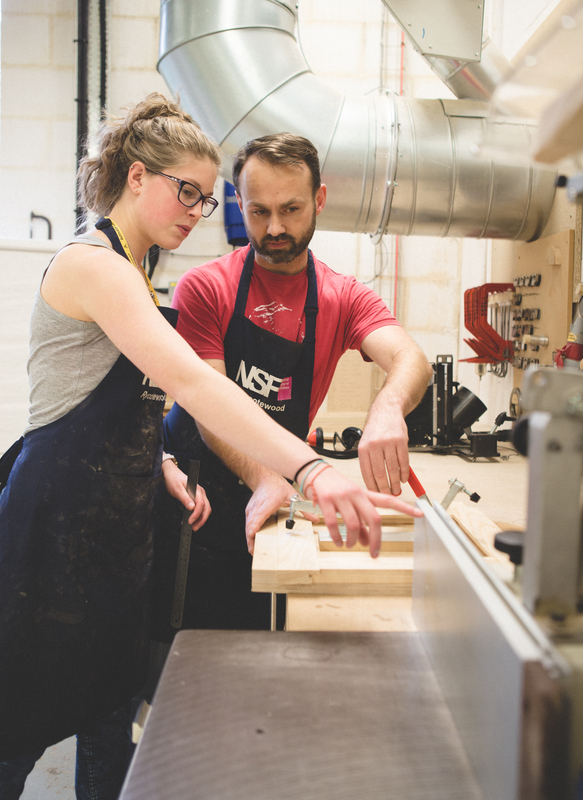 My current research interest is to understand better how to upskill furniture graduates making them more employable – considering how to bridge the gap between education and professional life. I have been successful in an application for funding and was announced as a Churchill Fellow in 2018. I will travel initially to USA in autumn visiting the Centre for Furniture Craftsmanship, North Bennett Street School, Rhode Island School of Design and Rochester Institute of Technology. Further travel to prestigious European institutions will follow in spring 2019. A report will be published in 2019 sharing the knowledge gained and recommendations for improving the education system here in the UK. I am a member of the Society of Designer Craftsmen and have served on the council since 2008 – I am currently responsible for the production of their quarterly newsletter. I am a fellow of the Royal Society of Arts. I am passionate about making, and very excited to get stuck into my new role, with Sylva Foundation, which for the first year I will be taking up while also continuing part-time with Rycotewood. My main responsibility is the development of the new Sylva Wood School, and in time I will play a lead role in supporting the delivery of training and courses. I’ll also play a key part ensuring the development of the Sylva Wood Centre as a beacon for best practice.